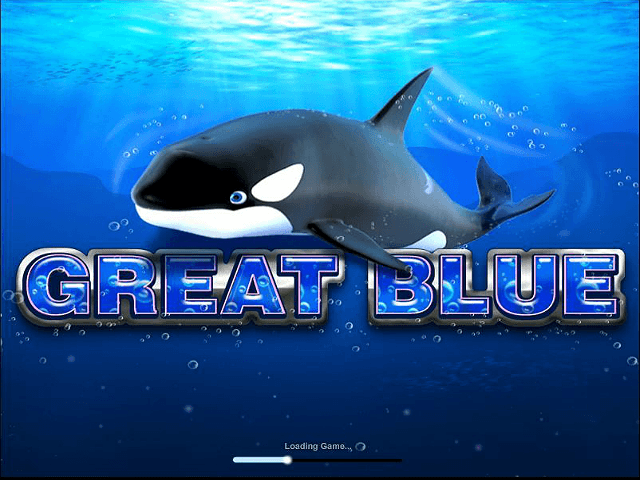 Dive into a world of whales, wilds and wonderfully juicy jackpots with Playtech's aquatic-themed online slot game, Great Blue. Something of a classic at this point but still packed with enough features and prizes to match the industry's top new online slots, Great Blue is a great game to try if you're looking for a timeless combination of fun and profit. 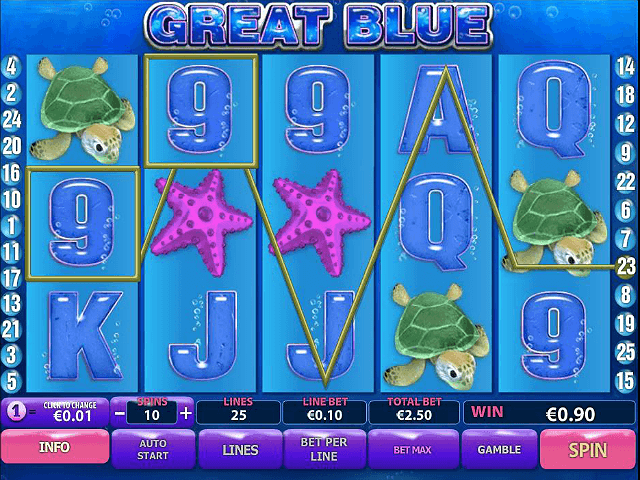 With this in mind, we've compiled a complete Great Blue slot review for your reading pleasure. Covering all the main features of the game, our guide will give you the inside track on what makes this game tick and what features you need to look out for if you want to bank upwards of £50,000. Let's take a spin under the sea. Play Great Blue for Real Money! Great Blue is a product of the Playtech design studio and that means you're getting a quality product at all levels of the game. This software provider is known for the development of high-quality online slots that take a central theme and run it through the entire fabric of the game, combining it with pristine graphics and an immersive soundtrack. Great Blue is no different. As you'd expect, the basis of the game is the sea and the Great Blue Whale. This naturally means the five reels and 25 paylines are submerged in a seascape of characters. 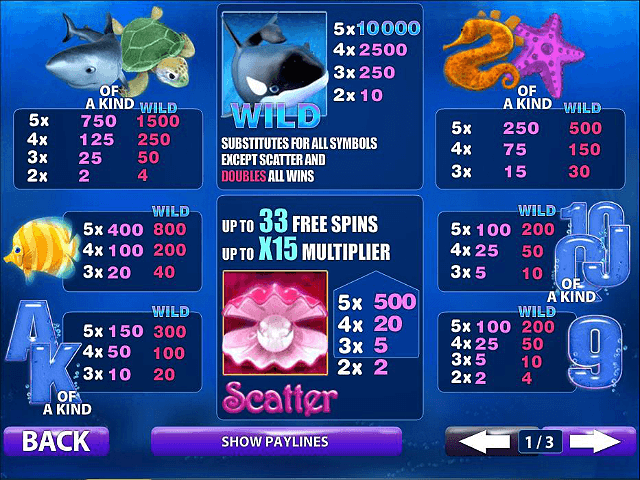 Everything from shells to fish are mixed in with the eponymous hero of this slot game. The whale symbol acts as Great Blue's wild and not only links style to function, but has the power to increase your wins (more on this a bit later). The Great Blue return to player percentage is fairly low for a modern video slot at 93%. This level of return is still high compared to other online casino games and as such it's classed as a high variance slot machine. 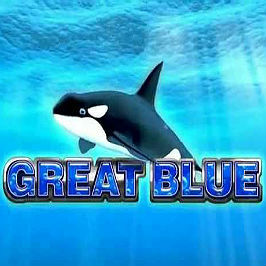 As a result Great Blue is more suited to intermediate and expert players. Although that doesn't mean you can't play Great Blue for free and hone your skills, it does mean you'll need a fairly healthy bankroll if you want to ante-up for real money. Before you get stuck into Great Blue, it's important to run through some of the basics. As is common with this slot game type, Great Blue has five reels and helping to increase your chances of spinning a win across these are 25 paylines. 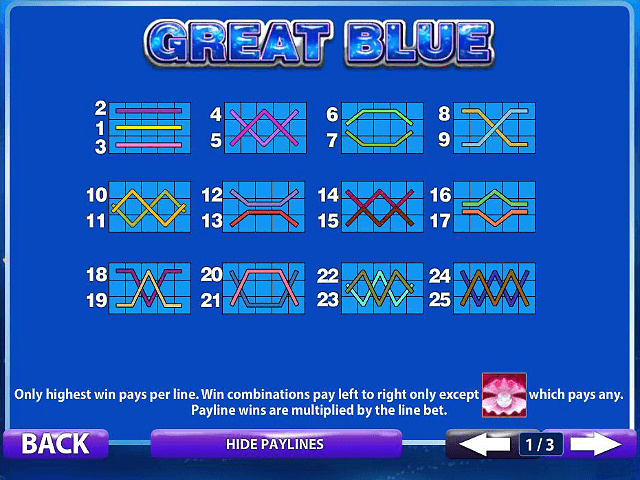 Under the rules of Great Blue, you'll need to stake at least £0.10 to get the reels moving. Beyond this, the max bet in coins is £5, which means you can stake as much as £50 per payline. When you combine all this, the max wager for Great Blue becomes £1,250. For those with less to spend, Great Blue's betting starts at just £0.01 per line. Regardless of the amount you bet, the payout table is based on multipliers. This means that everyone can bank a jackpot worth 10,000x their line bet when they roll in five wilds. To supplement the standard payouts, Great Blue's bonus round will keep your bankroll ticking over at a healthy rate. To start the Great Blue bonus round, you'll need to roll in one of the special slot game symbols. In this instance, three or more scatter symbols (an open clam) will take you to a bonus round where you'll see five closed clam shells. At this point it's your job to pick two clams to open. Depending on the mystery prizes inside, you'll bank as many as 33 free spins or prize multipliers worth up to 10x. When you combine all this with jackpots worth as much as £50,000, it's easy to see why Great Blue has been loved by serious spinners for the best part of a decade. Ahoy! Share this Great Blue Review today! If you like Great Blue, you'll love these slot titles too!